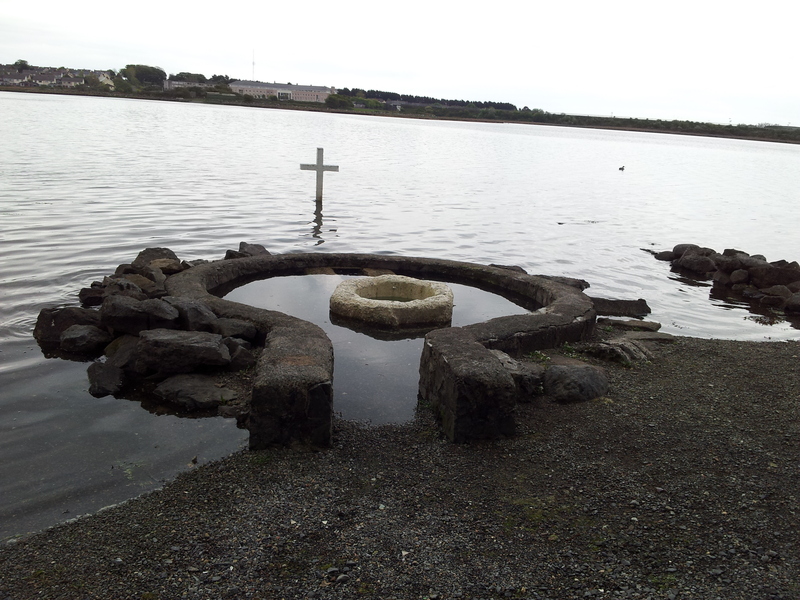 St Augustine’s Holy Well sits on water’s edge of Lough Atalia or Loch an tSáile, on the eastern edge of Galway city. Originally this well was one of a group of three, but the northern and southern wells no longer survive. The Galway Archaeological Inventory states all three wells were dedicated originally to St Augustine but Máire MacNeill (2007) refers to the northern and southern wells as being dedicated to the Blessed Virgin and John the Baptist. 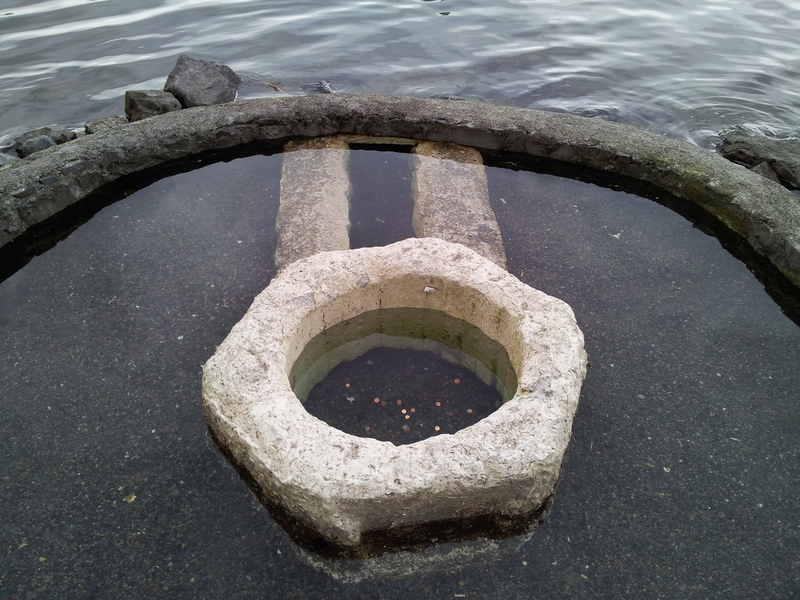 The surviving well has been very tastefully restored by the Galway Civic Trust in 2000. Today it consists of a concrete hexagonal trough surrounded by a low wall. The well is tidal and when I visited the tide was in, but it was still possible to get close to the well. The trough was filled with small coins . At the turn of the last century the main days for devotion at the well were the last Sunday in July or the first Sunday in August and MacNeill raises the possibility the wells may have been associated with Lughnasa. Low wall defining the holy well. During the 1600’s two very significant events happened here the first was an attack on a group of pilgrims by government forces and the second was a miraculous cure. In the 1660’s the Cambrensis Eversus tells us that ‘a great multitude of persons, men, women and children, assembled to bathe’ at St Augustine’s well ‘expecting to benefit their health by the salubrity which the waters have from nature or the prayers of St Augustine’. The Governor of Galway ordered his troops to open fire into the unsuspecting crowd without warning. Many were severely wounded and the others were stripped of their clothes and valuables and thrown into prison. This terrible event doesn’t appear to have dampened feelings of devotion of the local people towards the well and in 1673 it was the site of a miracle. O’Flaherty in West or H-Iar Connaught states that on the Feast of St Barnabie a fourteen year old boy Patrick Lynch son of Galway Merchant Patrick Lynch Fitz-Maurice and Redise Lynch was brought to the well. The boy was very ill with ‘a most grivous, desperate, and dangerous disease, and given over by all doctors to be incurable’. The text states the boy’s family had given up hope of recovery with ‘ all things were prepared for his death’. St Barnabie or St Barnabas on whose feast day the boy was brought to the well ( the 11th of June) was not a saint associated with healing being the patron against hailstorms, and patron of Cyprus and Antioch so it is unlikely that date was chosen to ask for his intercession. 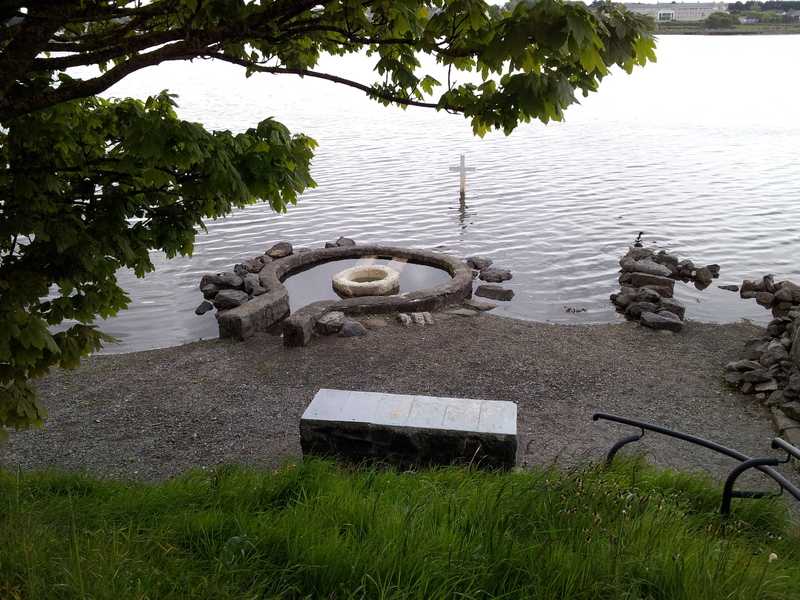 Having arrived at the well the boy was immersed in its waters and ‘having no fileing (feeling) thereof, and was brought upp was wrapped by Mary Burke into a wollin plaide’. The boy slept for a quarter of an hour before being woken by his mother who he promptly told off for having interrupted a vision he was having of ‘Our Lord Jesus Christ and his blessed mother and a multitude of brave winged brides’. The boy requested a cup of water from the well. He drank ‘three draughts in the name of the father and of the Sonne and the Holly Gost’. The boy then got up and walked about the well. He told his mother that in the vision, he had been advised to visit the well for nine days and to drink the water three times at each visit. The boy appears to have remained hail and hearty after the event and was cured of ‘the womiting disease, and dough eath and drinke ever since with a great apetit’. The miracle was investigated by a board of the clergy and laity of the town (Matthew Lynch, Warden of Gallway, Fr. William Bourke, Prior Ord. Pred., Fr. James Blake S. Theol. Lector, ord. S. Fran., Fr. Dominicke Lynch, Fr. Dominicke Martin, Prior of S. Augustine, Fr. Edward Bourke, Fr. Martinus French, Patricke Martine, Anth. French, Richard Martine, & finally Marcus Lynch). Sworn depositions were taken from the boy, his parents and Mary Burke. The family and Mary Burke were steadfast in their belief that a miracle had occurred, the board were not so certain and believed the cure may have been ‘attributed to hydropathy, i.e. cure by cold water’. Gosling, P. 1993. Archaeological Inventory of County Galway, Vol. 1 West Galway. Stationary Office, Dublin. Hardiman, J. (ed) 1846. A Chorographical Description of West Or H-Iar Connaught: Written A.D. 1684 By Roderic O’Flaherty, Trinity College (Dublin, Ireland). Library, Irish Archaeological Society, Dublin ( Google eBook). MacNeill, M. 2007. The festival of Lughnasa: a study of the survival of the Celtic festival of the beginning of harvest. Dublin: Folklore of Ireland Council. This entry was posted in Holy Well and tagged Galway, Pilgrimage Ireland, Religion, St. Augustine. I pass this well every day…pity the functionality is gone…not potable water anymore…ah well… thats live oin a modern world…better that having to go there to cure your headache I suppose. Great tradition though.